NASA's bid to test a revolutionary scramjet aircraft on Saturday failed even before it began when the Orbital Sciences-built Pegasus rocket launching the X-43A vehicle veered off course and exploded only moments into flight. The modified Pegasus first stage booster, with the X-43A craft mounted to its nose, was carried by NASA's B-52 jet to a predetermined point above the Pacific Ocean off the coast of Southern California where it was dropped for an air-launch at about 4:45 p.m. EDT. The rocket free-fell for five seconds before its solid-fueled stage ignited for a planned 10-minute flight. But about 10 seconds into the ascent, pieces of the rocket were seen falling away as the vehicle lost control. "I don't think we can speculate yet exactly what happened to the booster. It is clear that shortly after (ignition) that something caused the stack to veer off course," said Kevin Petersen, director of NASA's Dryden Flight Research Center where the B-52 took off for the ill-fated launch. "We do not want to speculate on the cause because we have a mishap investigation panel that determines the cause," Jeremiah Creedon, director of NASA's Langley Research Center that manages the X-43 program, told reporters a few hours after the failure. An interim investigation board was established on Saturday to pull together information and data recorded during the launch. A Mishap Investigation Team will be named on Monday to conduct a thorough inquiry into the accident. "The whole vehicle was very heavily instrumented, so we are hopeful and confident that we will have a lot of data to analyze and reconstruct what happened," said Petersen. Safety personnel sent destruct commands to ensure the vehicle had broken apart and wouldn't threaten people on the ground. Debris showered a pre-cleared impact area in the Pacific. 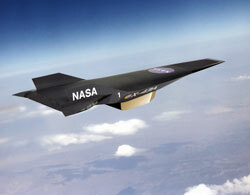 The rocket was supposed to climb to an altitude of 95,000 feet before releasing the the 3,000-pound, 12-foot long X-43A craft as part of NASA's Hyper X program designed to test "air-breathing" engine technologies for future hypersonic aircraft and reusable space launch vehicles. Theories of what might have caused the failure range from an aerodynamic flaw with the modified vehicle, to a guidance problem or a system breakdown. It is also unknown if the Pegasus or X-43 craft caused the incident, with NASA ruling out nothing. Of the 30 previous Pegasus flights, three have failed completely including an explosion in the inaugural launch of the XL-version rocket that was blamed on poor modeling of the rocket's aerodynamic design. Two other launches were deemed partial failures because lower-than-planned orbits were achieved. 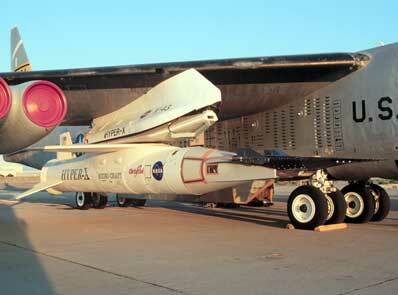 The winged-Pegasus was fitted with a specially-designed adapter structure where the X-43 was attached for the launch. Officials said a model of the combined stack had undergone extensive wind tunnel testing along with computer modeling. But as Creedon pointed to reporters, "there is only so much you can do on the ground and in wind tunnels, particularly at these flight regimes and you have to go fly." Saturday's flight used only the first stage of Orbital's Pegasus. For a typical space launch, the Pegasus features three stages. Hyper X program manager Vince Rausch says the Pegasus stage has some alterations just for X-43 launches, but it is basically the same booster used to deliver small satellite payloads into Earth orbit. "There are modifications to it for the additional thermal load it takes and the flight trajectory is considerably different, obviously, to put us into the 95,000-foot test conditions. But the fundamental booster is very, very much the same as a standard Pegasus." Given the similarity, the planned Thursday launch of NASA's High Energy Solar Spectroscopic Imager satellite aboard a Pegasus rocket off the coast of Florida is in serious doubt. The Orbital Sciences L-1011 carrier jet with the rocket bolted to its belly touched down on the rain-soaked runway at Cape Canaveral Air Force Station just before 8 p.m. EDT Saturday, completing a cross-country ferry flight from the Pegasus home base of Vandenberg Air Force Base in California. Saturday's test -- the first of three for X-43 vehicles -- was supposed to have been the first time a supersonic combustion engine, called the scramjet, would power a vehicle in flight at hypersonic speeds -- those above Mach 5 or five times the speed of sound. Unlike a rocket that must carry its own oxygen for combustion, an air-breathing engine scoops oxygen from the atmosphere. Without the need to carry oxygen, an air-breathing engine powered vehicle can carry more payload than a rocket-powered propulsion vehicle. Plans called for the first two flights to reach Mach 7 and the third at Mach 10. Built by MicroCraft in Tullahoma, Tenn., the X-43 vehicle in Saturday's mission was supposed to fire its hydrogen-fueled scramjet engine for 10 seconds after separating from the Pegasus rocket. The craft would have then performed a seven-minute glide to test high-speed maneuvering, obtaining data on hypersonic aerodynamics before splashing down in the Pacific. "We're obviously disappointed," Rausch said Saturday afternoon. "But we're going to go find what happened, fix it and fly again successfully." "This is a high-risk, high-payoff research," Creedon said. "And for that reason this is a three-flight mission." Despite the setback, NASA says it will press ahead with the $185 million Hyper X program. "We have a second (Pegasus) booster and (X-43) vehicle here at Dryden that are going to be undergoing checkout for flight. We will continue with that," said Rausch. "Obviously we will be waiting for the mishap investigation to determine what, if any, changes are required for the booster and or vehicle. But while we are waiting we will continue with the program and do what we can. There is a lot of checkout and things like that that we can do."